A late first serve at the Bob Devaney Sports Center on Saturday night pitted the #7 Nebraska Cornhuskers Women’s Volleyball team against the visiting Indiana Hoosiers. It was a short night, as the Huskers took care of business 3-0 (25-8, 25-14, 25-13). The match started with two Husker points. Indiana’s first point was a Husker service error, but they used their serve to tie the score at two. From there, the Huskers controlled the match early, opening up a 7-3 and forcing an early Hoosier timeout. Two of Mikaela Foecke’ subsequent serves were aces, and the Huskers extended the lead to 11-3, leading to Indiana using their final timeout of the set early. Briana Holman scored next for the Huskers with a solo block on the Hoosier middle attack, but Indiana stopped the Husker run on the next point, taking the serve with the Huskers leading 12-4. Nebraska opened the advantage even further as Indiana seemed unable to find a way to score. Most Hoosier points came off of Husker errors and the Huskers took the first set 25-8. Nebraska hit .667 for the match with only one attacking error. Mikaela Foecke was a perfect five for five to 1.000 and Holman had five kills of her own and hit .667. While Nebraska started off the second set blocking the Indiana attack, that block fell out of bounds and gave Indiana the early 1-0 lead. Foecke answered immediately with an off-speed attack bringing the serve back to Nebraska. That kill by Foecke sparked a six-point Husker run which resulted in another early timeout for the Hoosiers, their first of the second set. The Hoosiers recorded their second point of the night when Hunter Atherton’s serve sailed past the baseline, making the score 7-2 Nebraska, but the Huskers got the ball back on the next point began a new run. Indiana scored to stop the Husker run and make the score 10-3 Big Red. They did it again to make it 10-4 Huskers, but Nebraska got the sideout to stop that run. The Huskers couldn’t hold serve, however, and Indiana again scored two in a row to close to within five at 11-6. After Nebraska opened up a lead, Indiana again scored to close to within five at 13-8 Huskers, but the Huskers found away to score again and started another run of their own with Sydney Townsend serving. The Big Red ran off five-straight points, punctuated by a huge swing out of Annika Albrecht, to force Indiana to use their second timeout of the set trailing by ten, 18-8. Townsend recorded an ace out of the timeout to extend the Husker lead, but the next Indiana attack found it’s way around the Husker block to score for the Hoosiers. The first Nebraska set point came with the score 24-12 Huskers. Indiana fended that one off, a tip finding its way down through a couple of Husker touches, to give Indiana the serve. The Hoosiers blocked the next Husker swing, but Nebraska prevailed on the next point taking the set 25-14. Mikaela Foecke had ten kills on thirteen swings through the first two sets to hit .769. Holman had seven kills and was hitting .357. Overall Nebraska was hitting .436 after the first two sets while holding Indiana to -.100. Nebraska started off the scoring in set three, but then Indiana scored two to take an early lead. An Indiana attack into the net tied the score at two. The early part of the set followed the pattern from the earlier sets. This time, the Huskers opened up a five-point lead, 8-3, before Indiana used their first timeout of the set. Kelly Hunter sailed her next serve long, missing even the Nebraska at the end of the court, to end her service run and give Indiana a brief respite. Indiana made good, scoring again to bring the score to 8-5 Huskers, but Holman put down a ball to give the serve back to the Huskers. Foecke’s serve ended up in the middle of the net to give Indiana the serve again, and then an Annika Albrecht attack missed to bring the Hoosiers to within two of the Huskers at 9-7. The Huskers sided out and DS Hayley Densberger got her first action of the night serving for the Big Red, and she extended the lead to 12-7 before Indiana used high hands off of the block to score. Nebraska got the serve back and with Townsend on the line, the Huskers extended the lead to 16-8, with the last point an ace, to force the final Hoosier timeout of the set. Townsend’s serving run continued, with the Huskers pushing the lead to 19-8 before an error gave the serve to the Hoosiers. The Huskers got the ball back and put Albrecht back to serve. It was also the first time the Devaney crowd saw Sami Slaughter for the night. Albrecht recorded an ace with her first serve to make the score 21-9, but the Hoosiers found the floor with their next attack to sideout. After two Indiana points, the Huskers had Kenzie Maloney serving and Chesney McClellan entered the match for Holman across the front row. Indiana took advantage of the inexperienced players getting some reps and closed the score up a bit, but with Kelly Hunter on the line, and three freshman in the front row, the Huskers finished the night off with a 25-13 set win. Nebraska hit .393 for the night while holding Indiana to -.065. Foecke hit .591 with 14 kills, the only Husker in double-digits for kills on the night. Holman had eight kills and hit .400. Defense again looked good for the Huskers, with Albrecht notching 10 of the Huskers’ 36 digs and the team recording 12 blocks. Lauren Stivrins had one solo block and five assisted blocks. Holman had three solo blocks while assisting on three more. The Huskers have focused on serving teams tough this season and that mentality was on full display tonight with the team scoring nine aces, with Foecke, Townsend, and Atherton each getting two. 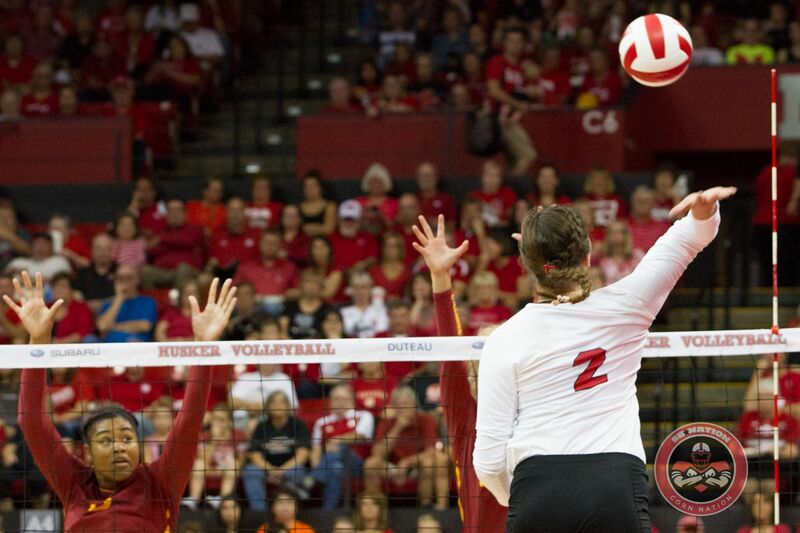 After the emotional, intense Friday night match, this was an easy match for the Huskers to let down, but they didn’t. Indiana had hit in the negatives the night before against Iowa and Nebraska did it to them again in Devaney. It was a great night with the diverse abilities of this team on full display.